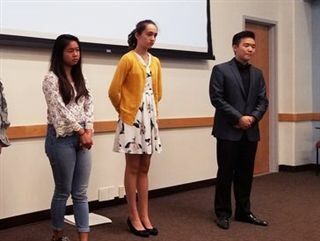 Shelby Aguilar '18, Maylane Gerber '19, Vanya Gupta '20 and Zoe Sipe '19 (shown in yellow) participated in the Social Innovation Sprint at UCSD last month. The program develops design thinking and entrepreneurship skills by challenging college and high school students to tackle social injustices such as homelessness and human trafficking. Congrats to Shelby and Zoe for being part of the winning teams! Another session in January will focus on climate change.